We offer promo table with and without printing with free delivery in India via Fedex. Promo table are printed on high quality laminated eco solvent vinyl for best output. [+] IMPORTANT - Currently we are delivering promo table only in NCR and Mumbai. In last few years, we are witnessing an unprecedented growth in outdoor display items. Standee & canopies are the one which comes first to the mind. Not far behind is promo table, these tables are robust and can fit in a person. As these are still limited in use, therefore they do have new appeal which catch audience attention. These are portable, easy to carry & assemble. It comes with black carry case. They are made of either composite ABS body, plastic body or thick MDF board. These are weather resistant & can withstand strong winds. Made of professional graded material which are industry level tested and are reusable which change in display banner. We have started offering these display counter as late as 2015, and they are showing good growth. Being market leader in standees, we were unsure how it will be taken in a price driven market. But to our surprise its growth is in no way less than standees. We can both solvent or eco solvent media for banner to used in promo table depending upon the budget. You should not print your banner in flex or star flex as they don't come with gumming like vinyl. Flex and star flex need to be glued for pasting or tapes which will not last for too long and it will not be visually appealing as well. Solvent vinyl also known as normal vinyl or eco vinyl which is known as digital vinyl can be used. We at Whizz Prints, provide promo table with eco vinyl pasting and it comes with lamination. You can choose from matt or gloss lamination, both at same price. Banner size is displayed in the promo table size photo. As these are digitally printed you need to provide image in high resolution preferably minimum 300 DPI for best print quality. We offer free delivery of these promotional tables all over India via Fedex. These are easy to assemble and carry. You will receive flyer and video link as demo which you can refer to in case you find assembly difficult. It has very simple to use structure without thousands of joints or bolts. Installation can be done by most of people in less than 5 minutes. If promotional table is not the one which has gain your interest than you can go with standees or canopies. Standees star flex cost is lesser than that of promotional table. Standees are available in 2x5 and 3x6 ft size. Canopy are available in 4x4x7 ft and 6x6x7 ft. If you wish to change the promo table banner than you can place order for banner. Order for eco solvent banner you can order for custom size as displayed above and it will be delivered to your place. Now you can replace earlier table banner with the new one. Do you print promo table in any other material apart from vinyl? We print and recommend only on high quality eco solvent vinyl with lamination. You can choose either gloss or matt lamination. Eco solvent vinyl is also known as digital or latex vinyl. If you are looking for printing more than 5 promo table for your company then we can offer you great discounts, to know more, kindly feel free to contact us. If I place order for two designs 1 each then will I have to pay rates for 2 promo table? I got one of the promotional table done from whizz prints and the banner print quality was just excellent it has very clear print with Matte lamination. The only thing which I did not like about the services that they do not deliver the promotional table outside of Delhi and Gurgaon therefore I have to come all the way from Noida to collect the table. Price is very competitive and compelling. Overall this service is good but delivery needs to be improved. I got my promo table order. Waiting for standee order 78097-TpL as well. This order is good and colors have come out well. Product quality is also ok. Thanks got it today in my office as reported by my staff. I havent personally checked it but my team is saying promo table are OK. Will take your service again. Well it got delayed initially as my design was not proper. But thanks to their support team, they told me how to get it correct. Overall nice experience as this is a professional company with good support. By default they have matt lamination, there should be option to select gloss lamination as well in cart page. This was my first printing order from any company. I am frequent buyer at Amazon and Flipkart. Your products are refreshingly good. Website need to be improved. Also add designs to choose from and more product options. I am from Bikaner Rajasthan. My order took 3-4 days only for delivery after courier. You should send via Speed Post not these private courier company for next orders. Our order number 78121-uPl was for promo table. Like to thank Disha who assisted us in getting the order completed in hurry as it was for an event. Will surely come back to you guys for future orders. Today me got delivery of 1 standee, promo table and business cards. We are from Kolkatta. Searched few websites for online delivery of promo table. Their prices at first glance appeared on higher side but when we compared rates of other websites which has additional delivery charges and GST, their prices was in similar range. Product was nice and well delivered. Would love to get some discount for future orders. I am from Axe Tools Systems. 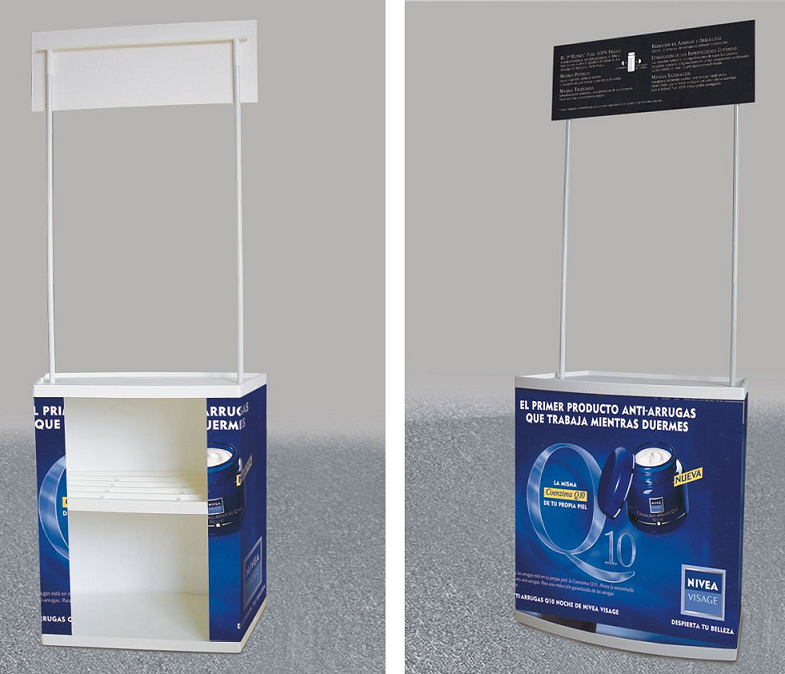 Place order for 2 pieces of promotional stand with our company details. Print quality was ok and it came with lamination. Good part i liked about them that they did not charge anything for delivery. Our company got a requirement done from them for promotional table without umbrella. We were not having designs etc just logo and companies. Paid for their designer. Print and quality is very good. It is robust. These will be blank promo table without any printing. 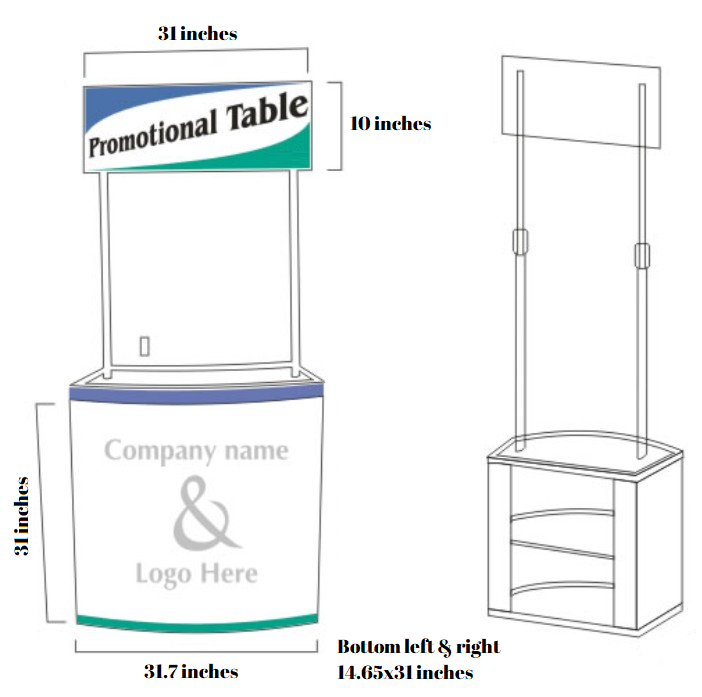 Body color of promo table will be white, you can paste banner or even sticker on these promo table. Eco solvent vinyl printing on all 4 banners with gloss/matt lamination.